Children who have not received all their vaccinations should not be allowed to start school, a Labour MP has suggested. Speaking in the left-wing Fabian Society magazine, Mary Creagh said the move would increase the uptake of the controversial MMR vaccine. In the same article, public health expert Sir Sandy Macara suggests linking child benefits to vaccinations. The government says it has no plans to introduce compulsory vaccinations. 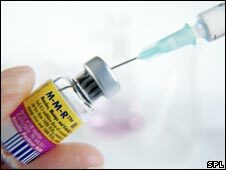 Public confidence in vaccination, and in MMR particularly, fell after research raised the possibility that the jab may be linked to an increased risk of autism. The research has since been debunked, and a string of studies have concluded that the triple vaccine - which protects against rubella and mumps as well as measles - is perfectly safe. But immunisation rates are still well below the 95% needed for so-called "herd immunity" and are particularly low in London. As a result there have been several outbreaks of measles. Ms Creagh said primary schools should be compelled to demand proof that children had been given the full range of routine jabs - including MMR - before they could register. The MP for Wakefield, who is also in charge of drawing up the Labour party's public health manifesto for the next election, said the sanction had been used in the US. She said: "The MMR vaccination rate is at 85% and the target figure is 95%, so it's about catching children who may have moved or lost contact with their health visitor but also saying to parents your child has a right to live free from vaccine preventable diseases." She also said there would be exceptions where children could not be vaccinated for medical or religious reasons. "In lots of cities now they are offering catch-up MMR for five-year olds and there's a high take-up - a lot of anxiety has gone away and it offers parents another opportunity," she said. Sir Sandy Macara, ex-chairman of the British Medical Association, said in many developing countries immunisation rates were higher than in the UK even though they had poorer access to healthcare. "People here have become a bit blase and they worry more about rare possible risks of vaccination rather than the diseases they prevent," he said. "One ought to recognise that mothers have a responsibility for ensuring their children are protected." He said linking vaccination to child benefit would ensure full vaccine coverage and make the argument that it was being done for the public good rather than for the benefit of individuals. "Politicians are much more anxious than they would admit about 'nanny state' accusations but they should be more worried about being accused of negligence," he said. British Medical Association Chairman Dr Hamish Meldrum described the proposals as "Stalinist" and said forcing parents to have their children inoculated was "morally and ethically dubious". "A Stalinist approach like this would be likely to backfire on an unprecedented scale and increase opposition to vaccinations," he told the Sunday Telegraph. Jackie Fletcher of pressure group Jabs was against both proposals. "It's only six months since a big public consultation by the Nuffield Council on Bioethics which we contributed to and they concluded there was no reason to change the voluntary system," she said. "At the same time as this was published in the UK there was a huge furore in the US as parents were threatened with hefty fines and jail unless they vaccinated their children before entry into school. "Is this really the direction we want to go in?" Joff McGill, of Sense, the national rubella charity said: "Sense believes that in the current environment compulsory vaccination would lead to more people challenging immunisation and so less children being vaccinated." A spokesperson for the Department of Health said they wanted to see a continued improvement in the uptake of the MMR vaccine, adding that "vaccination in this country is voluntary".